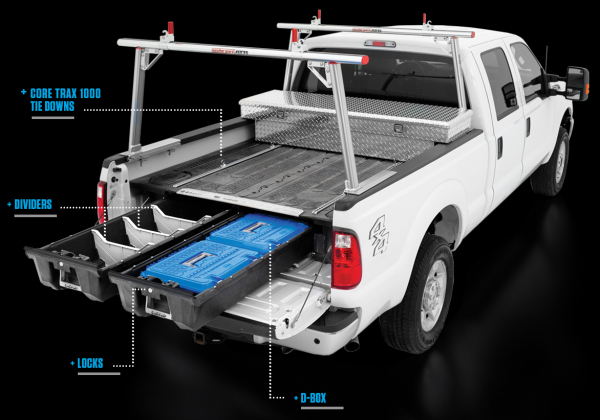 DECKED In-Vehicle Storage Systems built from 100% recycled HDPE co-molded to a Steel sub-frame providing a 2,000 lbs. load capacity. Keeps your tools and gear secure, dry, and out of the elements. The DECKED organizer enhances productivity and efficiency with Cargo Vans. Reduce trips in and out of vehicles as well as awkward reaching for and lifting of tools and other necessities with a solution that delivers cargo directly to the workers' ergonomically preferred "power zone". With a 220 lb system weight DECKED maximizes vehicle utility without significantly affecting fuel economy or vehicle payload capacity.